All of us have far more in common with one another than we realize. The things we enjoy, such as music, have profound impacts on our individual experiences. Music, even with words foreign to us, has the power to inspire our emotions and trigger memories. It also has the power to bring us together. Being human, music holds the power to magnetize us to one another. Without any prior knowledge, we share the same flood of feelings from across the world, and it has the strength to shape our shared experiences. 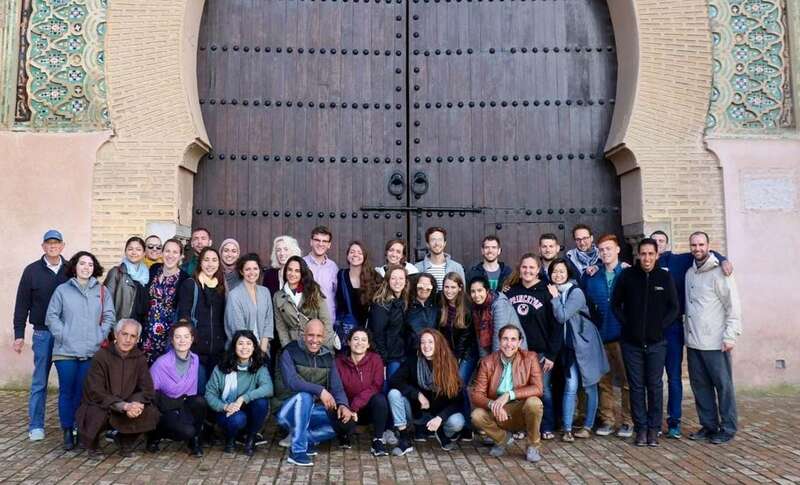 Max Nichols is a 2017 Connecticut College Fulbright research fellow who now works and lives in Amman, Jordan. 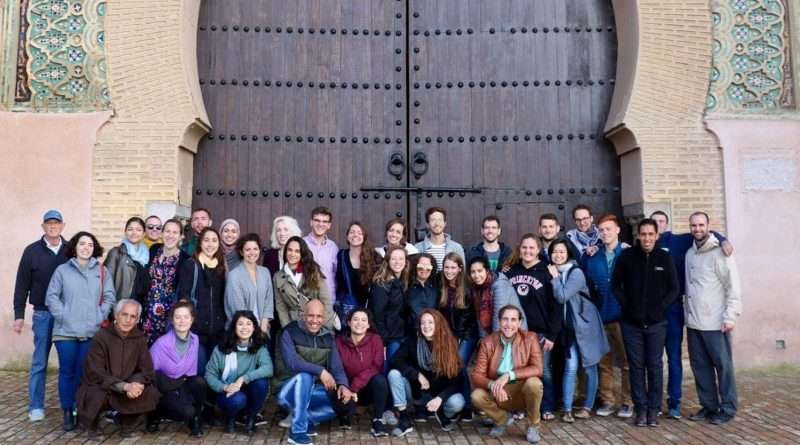 His research was hosted by the Refugees, Displaced Persons and Forced Migration Studies Center in Yarmouk University and centers on the country’s response to the Syrian refugee crisis in the north of the country. He also, interestingly, moonlights as a country music DJ, going by the name DJ Doyle. Nichols also hosts a country music show in Jordan called “Big Country with DJ Doyle” at Bliss 104.3. He has hosted the show every Saturday since April. 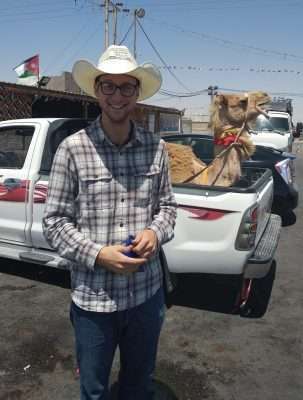 A lover of camels, Nichols takes a giddy photo with what is a common sight in Jordan. Nichols got the name DJ Doyle from his family’s roots in the Lassen County area. His great-uncle Dewey Anderson ran cattle in Doyle, hosting the work of generations of Nichols family on the ranch. Both Nichols and his brother had been weighing what to do with the property, which was by then mostly broken up and sold. The idea for the show’s name was sparked from the nostalgia for his past, his roots and the traditions he holds alongside it parallels to country music as the similarities found in the traditional music of the Jordanian people. At Yarmouk in Jordan, Nichols’s work originally centered on human-centered design and technology design. Through his research, Nichols now works as a digital financial services consultant for Mercy Corps, which means he helps to revolutionize the Jordanian digital payment system for mobile cash assistance to female refugees. Nichols explained the research he does revolves around the assessments of the refugee assistance technologies. The technologies, which many of the refugees depend upon, rely on access to the Internet. Notifications alerting vulnerable populations depend on a human-centered approach, however, Nichols mentioned there are complications to success. This makes the delivery of humanitarian aid to Syrian refugees in Jordan all the more complicated. Nichols detailed that there are still close to 1 million refugees in Jordan. Many are in camps designed for around six months of occupancy, but now the average time refugees are spending in camps is 17 years. The Jordanian National Aid Fund provides protection and support to needy individuals and families through financial aid, employment opportunities, health insurance services and vocational training to 80,000 Jordanian families. To account for all of the country’s vulnerable populations, the expansion of this fund’s purview is currently being assessed. Nichols likened the fund to Cal Fresh of California or SNAP benefits. However, with donor fatigue and limited resources from the Jordanian government, unless foreign donors (or a cooperative effort of the private and public sectors) are willing to help the expansion of the dire circumstances for refugees in Jordan, that reality may be far off. Nichols’s work in country music translates well in Jordan. Which is not surprising for those who don’t know much about Jordanian music. Nichols spoke of the music of the rural desert-dwelling nomads, known as the Bedouins of Jordan. The music shares similar acoustic sounds and its themes are comparable to country music. Themes such as love songs, extolling the virtues of the beauty of nature, and elements corresponding to a longing for the way things used to be. A favorite shady lunch spot for the scholars, Nichols and his peers take in the beautiful view of nature whenever possible. Nichols recounted another indicator, reflective of the similarities in Jordanian music and country music in the United States. 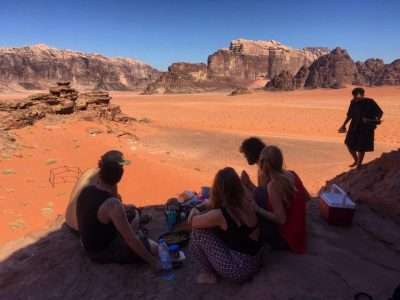 With friends in his car while passively listening to the usual Arabic music that crosses the Jordanian airwaves, a familiar sound came across the radio. It was the opening of “Whisky Lullaby” by Brad Paisley and Alison Krauss. “So they’re such fans of sad music that this really spoke to them. It turns out that’s actually one of the most popular country songs here,” said Nichols. Nichols further showed, as a consequence of his considerate and conscious efforts, he was able to make true connections. Rather than utilizing his positions for superficial self-gain or approaching his work and life in Jordan without engulfing himself in understanding, Nichols’s made concerted efforts to reach out and meet Jordanians at a level of understanding, empathy and camaraderie. His work to personally and fully educate himself on their culture, language and personally engulf his life with Jordanians has brought an authenticity and weight to the sincerity of the work he does as a DJ. In Nichols’s near future, he plans to host a podcast in Lassen County called Dispatched in Doyle, to be conducted out of Doyle. Nichols is looking to dig into the indicators of societal migration patterns and their impact on music. The nature of his endeavor takes the world of his lived experience, especially in its relation to his time in Jordan, and finds the pulse that binds us from across the world. He’s keying in on Reno, a city population of destination and displacement.